There is then a marriage for Henry Thorne of High Bray, leaving us to suppose that the husband of Dorothy Davy is the son of Richard and Mary Thorne, baptised in Bishops Tawton. The parish of Bishops Tawton is adjacent to Chittlehampton, where Henry Thorne spent his adult life. 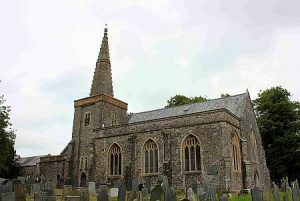 The village of Bishops Tawton is just south of Barnstaple and Chittlehampton is further SE. Most of the parishes in this NW corner of Devon have registers going back a long way, yet we have found it difficult to trace Richard. No convincing baptism for him has yet been found. 1692 May 15. Richard Thorn and Mary Treble. MARY TREBLE. The most likely baptism for Mary is in South Molton, where she married. 1656 Aug 10 Mary the daughter of John Trebell. But this would make her 36 at the time of her marriage, which is rather old. Alternatively, there is a marriage in South Molton for Robert Treble and Mary Autrye on 19 Oct 1689, but Robert does not appear to have died until 1739. There are widely spaced baptisms in South Molton for the children of John Trebell. As well as Mary there are sons in 1648 and 1667. In both Richard and Mary’s case we wonder whether there are other baptisms which have been lost. No children of this couple were baptised in South Molton where they married. We have the impression that the Thornes moved from place to place. This may mean that Richard was an agricultural labourer who offered himself for work at the annual hiring fairs. There is a baptism in the small parish of Warkleigh, which adjoins Chittlehampton and is very close to South Molton. There is then a gap of 9 years before we come to the next credible baptism, in neighbouring Satterleigh. And finally to the nearby parish of Bishops Tawton. 1707 Aug 11 Sarah daughter of Richard and Mary. We do not know whether the first two baptisms are for the same family as the second two. It is possible that there is an alternative, and later, marriage between Richard Thorne and Mary in a parish register not found. There are a number of significant question marks over this couple and very little certainty. We do know that Richard and Mary were raising a young family in Bishops Tawton in the first decade of the 18th century. Bishops Tawton, as its name suggests, stands on the River Taw, shortly before it reaches Barnstaple. It was owned by the Bishop of Exeter, rather than a secular lord of the manor. The bishop had a palace here, which is now Court Farmhouse. A prominent feature of St John the Baptist’s church is the crocketed octagonal spire, the only medieval one in Devon. It was here that Henry and Sarah were baptised. For centuries Devon had thrived on its wool industry. The early 18th century saw the gradual transition of this trade to the north of England. There is a burial for Richard Thorne in Chittlehampton on 2 Oct 1741. Also in Chittlehampton a burial in 1744 July 17 for Mary Thorn. No other information is given. Chittlehampton is where Henry raised his family. It is possible that these were his parents. Sarah Thorn, who may be Henry’s sister, married George Smith in South Molton in 1738.